Many people are familiar with the term osteoporosis, but fewer have heard the term osteopenia, which means lower bone density than normal. If you have osteopenia, your bone density may be lower than normal peak level, but it isn’t low enough to be considered osteoporosis. Bone density is simply the measurement of how dense and strong bones are. Lower bone density puts you at a higher risk of eventually getting osteoporosis. 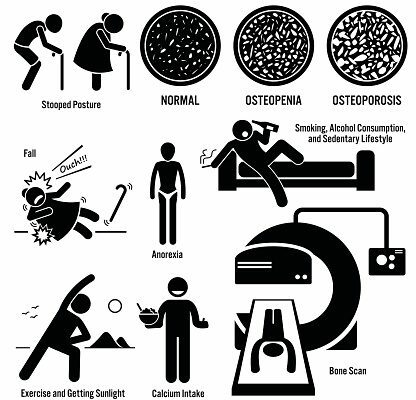 Low bone density is often associated with the elderly. As we grow older, bones become thinner due to the fact that the body reabsorbs bone cells faster than new bone is made. Other diseases or treatments can also cause osteopenia. Women are at a higher risk of developing osteopenia because they have a lower peak bone density and because bone loss speeds up around the time of menopause. Not everyone with osteopenia will be prescribed conventional treatment, such as prescription drugs. Osteopenia treatment guidelines are based on the risk of bone fracture for each individual patient. Some of the factors the doctors will look at when considering treatment include, whether or not a parent of the patient has fractured any bones, whether or not the patient has had any treatment with corticosteroids such as prednisone in the past, and whether or not the person has other medical conditions, like rheumatoid arthritis. The doctor will also ask about smoking and drinking habits. All of this information is used to calculate the patient’s risk of bone fracture within the next 10 years. Based on the calculation, the doctor will prescribe either medications or lifestyle adjustments. Lifestyle adjustments are a vital part of treatment for osteopenia. A big part of these lifestyle changes includes osteopenia exercises, such as walking and lifting light weights. It also involves making sure all the essential nutrients are being consumed, especially adequate amounts of calcium and vitamin D.
While severe osteopenia treatment may require strong prescription medications, many people with low bone density are able to turn to natural treatment. For example, the osteopenia diet emphasizes the importance of calcium, so consuming milk, diary products, and green vegetables is a good idea. Many people with osteopenia take calcium supplements. As outlined earlier, vitamin D is important. Your body requires it to absorb calcium properly. You can get vitamin D by spending 10-15 minutes outside in the sun each day, or taking a vitamin D supplement. Some nutritional experts suggest that a number of supplements have potential when it comes to strengthening bones. Some are listed below, but should be discussed with your doctor before you include them in your routine. Although research is ongoing, some nutritionists also suspect that herbs might be helpful including, horsetail, red clover, and black cohosh. While you are looking at food, vitamins, minerals, and herbs, consider adjustments to caffeine, alcohol, and sodas, since excessive amounts are not good for our bones. If you have been diagnosed with osteopenia, you should take steps to prevent falling as well. You can avoid walking when it is icy, make sure your home is well lit, install railings near the bathtub, and remember to wear shoes that fit properly and give you good support. The osteopenia diet has proven successful time and time again for those who suffer from this bone density condition. Even if you have not been diagnosed with lower bone density, you need a certain level of calcium. People aged 50 and older should be getting at least 1,200 mg of calcium each day. If you are 19 to 49, a daily dose of 1000 mg is recommended. It is important to note that too much calcium can cause health problems too, so if you plan on supplementing you should be supervised by a doctor. It is widely believed that getting enough vitamin D can prevent osteopenia and osteoporosis. Generally, between 400 and 800 IU of vitamin D daily is recommended, but some physicians may suggest a higher dose to certain patients. Foods such as breads and cereals, as well as fish are fortified with vitamin D. Just like calcium, vitamin D can be harmful in high doses so make sure you follow doctor’s suggestions. In terms of alcohol consumption, moderate consumption is okay. However, consuming two or more drinks per day has shown to impact the formation of bone and make it difficult for bones to metabolize calcium. There are certain foods that make calcium absorption difficult as well. These foods include beans, wheat bran, spinach, rhubarb, and beet greens. This does not mean you can’t eat these, it just means you have to make sure enough calcium in consumed outside of these foods to make up for it. Osteopenia exercises are not only for the treatment of the condition, but are to help prevent the condition from progressing to osteoporosis. Your doctor will determine if it is safe for you to take on an exercise routine. Weight-bearing exercise: these include exercise bands or simply walking and hiking. High-intensity exercise: this could be aerobics class, swimming, dancing or cycling. Balancing: posture and balance are important exercises to prevent falls. Pilates, yoga, tai chi, and stability ball workouts are examples. If you have been diagnosed with osteopenia and you are taking part in a regular exercise routine, you must make sure you do not overdo it. Too much exercise or overly aggressive exercise can be damaging. Some people with osteopenia have a fitness coach who is fully aware of their medical condition and can guide them during their exercise programs so they do not injure themselves. It sounds odd, but we do take our bones for granted. When you think about it, they serve an amazing function that we just trust will always protect us. Bones provide support and structure, and without them the human body would basically be nothing but a shapeless pile of tissue. Bones protect our vital organs and central nervous system, they form our backbone (vertebrae) and our ribs that house our precious heart and lungs. Whether we currently have osteopenia or not, we should be paying close attention to our bone health.